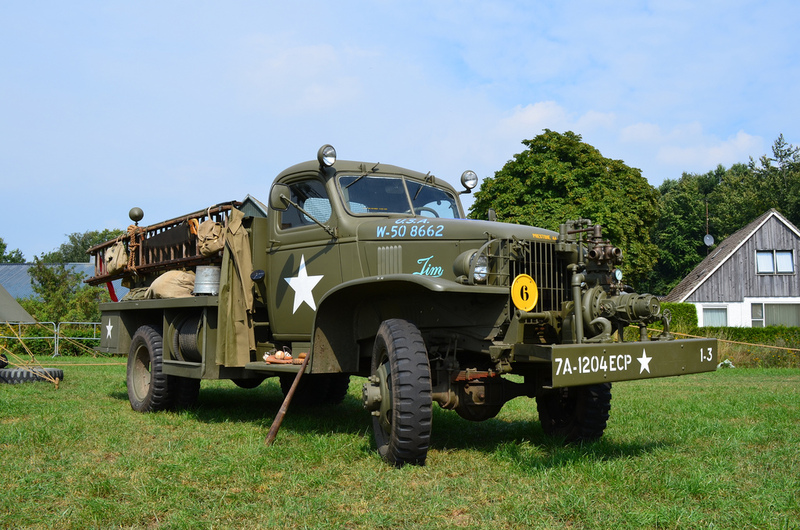 In 1941 Chevrolet produced 1-1/2 ton chassis with 4x4 running gear for the US Army. 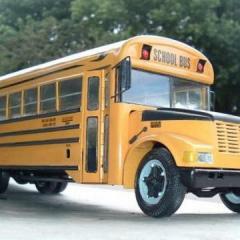 They used the standard civilian cab and 6 cylinder engine but made a heavier frame for the 145" wheel base. Several variants were made including a dump, cargo rig, communications rig, bomb truck, and three different versions to use as fire apparatus. The Class 325 was the fire version and had a front mounted pump, a 300 gallon water tank, a hose bed and a couple of ground ladders. It carried a variety of hand tools and fire related fittings. Here is what it looked like. Maxim Motors, along with a slew of other fire apparatus manufacturers built the body. This one is not Maxim as they (Maxim) rounded off the bottom of the hose reel compartment you can see just aft of the cab. No real differences between manufacturers other than that. As you can see the front fenders, hood and grill are strictly military style but the '41 cab is exactly the same as the Revell 1941 Chevy pickup kit. I've already started by building up the Chevy engine and it is painted olive drab like about everything else will be! The end result will be a 1/25 scale version of the Class 325 and will be sent to a 94 year old WWII veteran who was assigned to one of the fire fighting units that saw action in North Africa, Italy, France and Germany. He is still active, lives in Hawaii, and has supplied me with a ton of information for the build. In a couple of weeks I'll be traveling to New York to see an existing 325 that was preserved so I can retrieve measurements, photos of various items and details that cannot be obtained really any other way. As with other builds I will be posting as I go along. (The '52 Reo is on hold for now). Another scratch build fire unit from Charles Rowley? I'm in! Looking forward to seeing this come together like so many other masterpieces you have created over the years. Ooooo now this will be a Kool project to watch!!!! I know you’ll do it justice too!!! Should be an interesting build, Charlie. Where in New York is the actual truck you're going to go see? Is it at the FASNY Museum in Hudson? Can't wait to see this come together Charles..
Chatham Township which is about 25 miles west of Manhattan. I actually saw the truck and took a few photos back in 1990 at the 125th Anniversary parade of FDNY. I took a chance and contacted them to see if it was still around. Their answer came back immediately in the affirmative. I'm looking forward to meeting their crew. Well, we've got a start. Here are a couple of photos of the very initial beginnings of the build. We start with tires and wheels. The tires are resin castings that are the right size and tread pattern. The wheels are some adjusted pieces that I had in the stash. The fronts needed to be wider in order to project away from the tire like in the photo above. So two originals were modified. First part was to cut away the center portion, just leaving the outer rim. The second part was to do away with the rim but leave the center that could be moved outward. The result is what you see below. Before I made castings of the wheels I shaved off the 10 lug nuts as these rigs only had six. After the castings were made I drilled holes using a hexagonal drawing template to locate them. Then lug nuts and bolts were made from 0.020 plastic rod and some fusion hex beads. I still have to cast the outer rings for each wheel. The mold in the middle is for the hubs like you see at the lower right. The photo below shows the Revell Chevy cab, the dash board with the gage portion cut out for the military gage cluster insert and the finished Chevy six engine. I've glued in the firewall but that is as far as it can go until the interior floorboards are set. They will have to be cut away from the kit frame and to be installed on the larger brass frame yet to be made up. Those look like modified AMT American Lafrance wheels? I've got to get some of those beads. Lots of people have been using them lately and they look great. This is again going to be an absolutely fantastic scratch build (at least in my view and humble opinion). I'm always in with all your builds as I can learn lots of solutions for scratch build problems. What I'm always impressed with is the cast of wheels, tires and rims of all sort. Is it really not that difficult as it seems and can you possibly explain it in a couple of short sentences? Or did you do a how-to in the tips and tricks section which is easy enough to understand? I would really appreciate a little help on this. Maybe others would be interested as well! Where did you get the cab and the engine from? Or did you scratch them too? I'm keyed up for the next steps. Hello, Juergen: The wheels originally came from the AMT/Ertl American LaFrance fire engine kits. The problem with them is that the front wheels are quite flat in cross section. If you notice the front wheels in the photograph at the top of this post you will see that the middle part of the rim protrudes away from the tire. I should show the difference in the two rims so you can see what I did. As I explained above, I took two of the rims and cut both in two pieces; one to save the center portion and the other to save the outer portion. Then the center portion was re-inserted into the outer portion, leaving it slightly protruding out to improve the cross section. It was then glued permanently in place from the back. The hubs came from the same ALF kit. The tires came originally from a diecast Dodge Power Wagon. A mold was made of the tire and castings were made from there. The cab and engine came from the Revell 1941 Chevrolet pickup kit #85-7202. They are the exact pieces that are needed for the build. Looking good so far Charlie!!! Thank you Charles, it's getting a bit clearer now. I'll definitely follow your build. After making a trip to New Jersey to see a real Class 325 I was able to get some drawings put together for the hood and side pieces. My first attempt was to sculpt the entire hood piece from Renshape but then I realized that the only difference between the civilian and military versions of the hood was the front third. I think Chevy just cut off the front of the civilian version and welded in a new piece that would compliment the grill guard. So I took the existing hood and cut it at the length where the change was made and glued on a piece of the Renshape. Then it was sanded into shape. The next step is to make molds for the hood and hood sides. After the side pieces are cast they will be scribed in the back and bent outward to follow the hood contour. The louvers in the hood sides are made from 0.040" quarter round strip stock. Looking great Charlie!! Love watching you work magic on your builds!! The hood and hood sides having been done I will be starting on the frame next. I have drawings to scale and will use the Revell kit frame for some of the front end curvature. The main part of the frame that is under the cab and body is nearly 8 inches deep and runs straight back to the rear. I just noticed the raised area on the hood sides and the riveted front third, as you say, quite a neat detail that I would have overlooked. You certainly have a keen eye for detail! Nice work! Rivets are just 0.020" plastic rod snipped off. The raised area is a piece of 0.010" sheet stock cemented on 0.040" sheet stock behind it. I didn't necessarily have to use 0.040" thick stock for the basic sides but that thickness came close to being the same as the cowl sides that they will be against. One more piece in the works. Today I got the second frame rail of the frame soldered up and then made up some temporary cross members to control the frame width. I took three components from the '41 Chevy kit to secure the front portion of the frame and to give the engine some support. Next up will be to prepare the mounting points for the springs. Here are a couple of photos of the brass frame and the kit frame for comparison. Very little adjustment was needed to fit the plastic kit crossmembers. The only concern was where to place them within the frame length. The frame photos helped to solve that part of the puzzle. That's some amazing work Charlie. Just out of curiosity. Why do you prefer a brass frame over plastic? When you scale the frame down to size in most cases the plastic version would be far too flexible and subject to warping as various pieces are added. To be sure the cross members help but one cross member slightly longer or shorter than another can warp the frame out of being straight. The brass is a solid foundation to base the rest of the build on. There is also the strength factor. What it all comes down to is personal preference I guess. In cases where a kit frame works I'll use it. 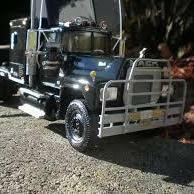 But when the truck is unique and you can't substitute a kit frame I like the brass. Thanks for the clarification. I may have to give it a shot on my next big rig frame. I've soldered brass before to make slot car chassis. I bet this is similar.